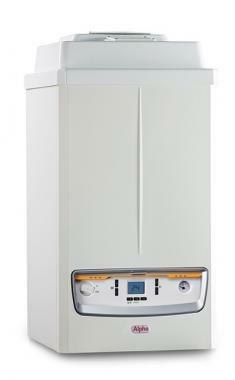 The Protec plus system gas boiler is designed for larger homes. This unit is is condensing and wall mounted, and is made and manufactured by Alpha. With it being a system boiler it directly heats your central heating system and hot water storage cylinder. Most of the important parts of the hot water and heating system, such as the pump and expansion vessel, are built in on a system boiler making it quicker and cleaner to install. It also means you get a faster response to demand for heating and hot water, plus you don't need to have a feed and expansion tank in the loft. This highly efficient boiler has an 88.7% efficiency rating as well as an output rating of 90 kW making the unit perfect for those properties with larger demand for heating and hot water. Being designed for larger output requirements, these fan assisted condensing system boilers provide heating only for sealed central heating systems or open system if required. This boiler features a stainless steel heat exchanger, a 2m long flying mains lead, suitable for single unit or cascade installation, open or concentric push fit flue system, built in plume management, easy access for servicing and built in commissioning. With it also featuring a fault finding system, so that in the unlikely event of the unit going wrong you will be able to diagnose the problem with ease. This boiler is supplied with type B23 flue configuration, an open chamber and forced draught this allowing flexible siting. This boiler also features 3 years warranty so you can be sure you are getting a highly reliable unit.